School can be hard enough. 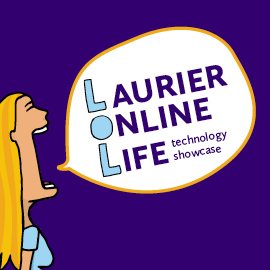 Laurier Online Life (LOL) is a technology showcase that will help students learn how dozens of online services can make life at Laurier easier. Staff from IT, the Library, the Bookstore, the Centre for Teaching Innovation Excellence and the Centre for Student Success will be on hand Sept. 12 from 10 a.m. to 2 p.m. in the concourse in Waterloo and Sept. 13 from 10 a.m. to 2 p.m. at the RCW in Brantford to answer students’ questions and let them in on tips and tricks. Students will learn how to get their Laurier email on their phone, how to quickly create a course schedule that works for them, how to navigate student services, where to find the research resources they need online, and so much more. Come for the technology tips but don’t miss the free food and giveaways! There will be two Apple Sport Watches to win!